Russian Prime Minister Vladimir Putin visits the GCTC. The Russian Federal Space Agency (Roscosmos) announced today that its director Anatoly Perminov signed the order officially creating the "United Cosmonaut Corps" (UCC). As a previous press release detailed, the new UCC unites Russia's three separate cosmonaut groups into one at the Gagarin Cosmonaut Training Center (GCTC) in Star City. Currently, GCTC has 22 cosmonauts, RSC-Energia has 17 cosmonauts, and IBMP has 1 cosmonaut, so the new UCC will have 40 cosmonauts in total. 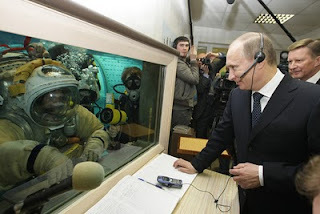 The main purpose of the consolidation is to "enhance cosmonaut selection and training effectiveness and to maintain coordinated national policy in human space missions." This move comes as the latest in a series of re-structuring initiatives in Russia's space program. On April 2009, Russian President Dmitry Medvedev signed a presidential decree transferring the GCTC to ROSCOSMOS from the Defense Ministry. PS: In un-related news, Congratulations to SpaceX on the successful launch and landing of the Dragon spacecraft!